A cyclist who recorded a Dublin Bus driver repeatedly tell him “I’ll run you over”, has yet to be contacted by the bus company. The confrontation started when the bus driver entered a cycle lane which the cyclist was already occupying. The lack of contact from the company is despite Dublin Bus taking the time to issue a statement to the media last Thursday, saying it received a complaint from the cyclist and that it is investigating. He is now considering reporting the matter to the Gardai. Phelan recorded the event on his helmet camera and uploaded it to YouTube. After it appeared on Broadsheet.ie the clip went viral — as of tonight it has been viewed 278,277 times. It was also reported on by a number of national and local media websites and radio stations. 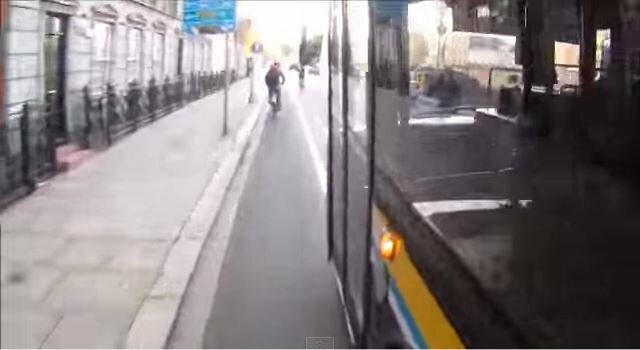 The video shows Phelan cycling in a cycle lane on Dublin’s north quays — as he cycles up alongside a Dublin Bus tri-axle bus, the bus starts to move into the cycle lane. It appears that the indicator on the bus, located near the front passenger door, is only activated when Phelan is nearly along side it and after the driver has started moving towards the kerb. 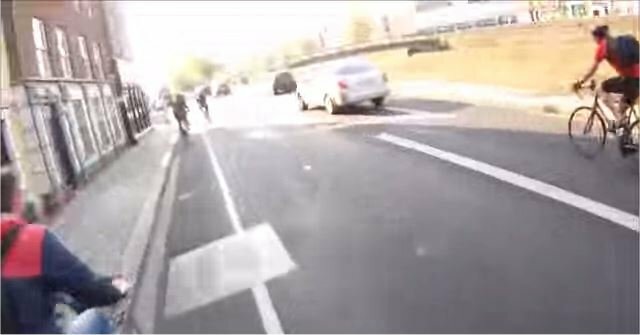 The YouTube clip then shows Phelan speeding up and getting on front of the bus, the bus driver appears to follow, and overtaking a second cyclist before turning towards a bus stop. However, the driver does not pull into the stop and the bus remains outside the bus stop markings while the passenger doors open and a passenger appears to exit the bus — IrishCycle.com understands that stopping like this away from the kerb is against Dublin Bus rules. Phelan confronts the driver at this stage and starts talking about the driver swinging the bus towards him when he was in the cycle lane. The bus driver interrupts, and referring to Phelan cycling on front of the bus, he says: “If you want to die, just go in front of me, I’ll run you over, no problem”. I wonder is the driver still on the road.For a professional he seemed a bit hotheaded. Unfortunately they often pass extremely close to Cyclists Handlebars at a fast speed while the Cyclists is on the Cycle Lanes. You would expect them to at least slow down but no they do not. Another thing they do is rush past a Cyclist/Cyclists to pull in to Bus Stops often on a Hill. It would be easier and more polite to wait for the Cyclists to go past the Bus stop before pulling in but very few actually do this. They seem to be all frustrated rushing around at fast speeds,I absolutely hate them coming near me. The first time you know about them is a rush of air then a huge shape going past you at a fast speed very close to you. It often takes you unaware and if not careful it causes a wobble until you straighten out. Beware at Bus Arus on Amiens Street beside Store Street on the journey out of Town,there is an Island in the centre of the Road facing the IFSC and this is a bad pinch point with Traffic trying to wedge its way through in two’s often a Bus and a Car side by side. I have been knocked over several times or had to just jump on the path to get away from them. There is the bend coming around from Beresford Place then the Cycle Lane suddenly ends and I think Motorists cannot see Cyclists around the Bend until it is to late or they do not see you at all which happened to me. I always try to avoid this area especially in the evening rush hour. Very big problem with Buses turning down Store Street to access Bus Arus and Cyclists on Amiens Street. There are two road safety issues in the video clip. (1) The driver quite deliberately crosses a continuous white line road marking delineating a cycle track (mandatory use type) (2) The driver is ovwertaking the rider too closely – dangerous overtaking which is a statutory offence SI No. 182 of 1997 (S. 10) attracting 2 penalty-points plus €80 fine. Unfortunately this is not an uncommon occurrence. Taxi Drivers are equally as bad. That’s not to say cyclists don’t behave badly too, but at the end of the day, it’s always the cyclist that is likely to pay a heavy price for such reckless behavior. I don’t have a great deal of confidence in An Garda Siochana as having any interest in sorting such bad behavior out other than diverting traffic in the aftermath of a crash. Nice camera work Liam. Guards are useless. Saw one today giving out to a cyclist using the Luas tracks completely ignoring a taxi doing a u-turn over a full line (and over the tracks in the wrong direction) and then blocking traffic to pick up a customer. After setting the cyclist straight the guard got on his motorbike passing the taxi and the cars stuck behind without even slowing down. I watched this video and to be honest, my sympathies were mostly with the driver. He wasn’t the most articulate guy – but what he trying to say was – “If you keep cycling in the blind spot of large vehicles you will be run over.” I drove trucks for many years. I sometimes cycle in an urban environment now, and I can tell you he’s right. You can argue about the rules of the road all you like, but it’ll be no good to you if you’re dead. If only one cyclist pays attention to what I’m saying it’ll be worth saying it. Regardless of wrong, right, rules or otherwise – NEVER ASSUME THAT THE DRIVER OF A BUS OR TRUCK CAN SEE YOU. And for your own sake, stay out of his/her blind spot..If you decide to do otherwise, you may be right – but you’ll also be dead..
You’re right — it’ll be no good to the person cycling arguing about the rules of the road if they are dead. But the fact remains that the bus driver was not following the rules and he should have admitted that when confronted. Saying “NEVER ASSUME THAT THE DRIVER OF A BUS OR TRUCK CAN SEE YOU” will not be much good to a bus or truck driver if they kill or maim somebody — they’ll have to live with killing or harming somebody and the likely loss of their job and possibly prison. I cycle to work most of the time and always use the cycle lane, where available, and I frequently am overtaken by bus drivers very closely and always being pushed aside by the rush of air. Nice one Larissa. I wonder if Bus drivers are trained to be “assertive” as part of their training. I have come across some courteous drivers, but an awful lot of nasty aggressive thickos as well. There is merit in what dem1 says, but it could easily be translated into NEVER ASSUME THAT THE DRIVER OF A BUS REALLY GIVES A DAMN AS TO WHETHER HE/SHE CAN SEE YOU. IF HE/SHE HITS YOU HE/SHE WON’T GET HURT” and given the lack of law enforcement, it’s unlikely he/she will ever be brought to book.